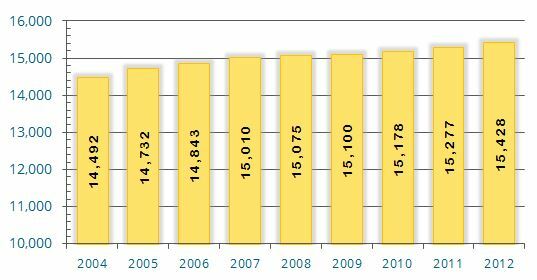 The official 2010 Census indicates that Grand Haven Charter Township’s population is 15,178, which is an increase of 1,900 residents (or about 14.3%) since the 2000 census (i.e., 13,278). This is an average of 190 new residents each year since the 2000 Census. When compared to the 1990 Census, the Township’s population has increased by about 5,468 (or about 56.3%). This is an average increase of 273 residents each year since the 1990 Census. Grand Haven Charter Township consists of about 28.59 square miles or 18,297 acres of land. The majority of this land is divided between Residential (10,601 acres) and Agricultural (3,357 acres).